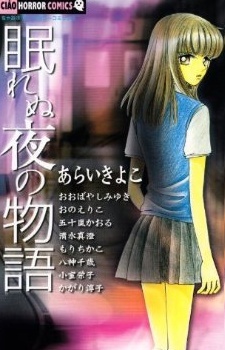 This is a shoujo horror anthology, containing 9 stories. After loving Shouhei ever since her second year of middle school, Natsumi finally gets to go out with him. But then she starts getting prank calls telling her to break up with him. Then mysterious things start happening around her. Pots falling from windows, insects in her locker, glass shards in her towel. Are these just harmless pranks, or is someone truely out to get Natsumi? "Forgive me! Don't kill me" Those are the words Honjou Kumi continues to hear in her nightmares. She lost all of her memories of the time before her accident, so she doesn't understand why the students stare at her and whisper. Pranks are pulled on her left and right. What is it that she doesn't remember? Koyuki and Hiroyo are the best of friends. They've always chosen to be with each other. Hiroyo always listens to what Koyuki tells her to do, because she knows best. So when Kinoshita says that he's in love with Hiroyo, Koyuki doesn't believe him. She says the only way she will believe him is to go to the lecture room at 5:55 pm to see the bleeding holy mother statue. Hiroyo tries to stop him, causing all three of them to see it. According to the rumor all the people who see the bleeding statue will all die. Things start happening, causing Hiroyo to be frightened. But only she is targeted. Could it be that Koyuki and Kinoshita are out to get her? Sakura is a timid girl, unable to say no, so when she sees two classmates throwing rocks at a cat, she wants to stop them but can't. They tell her to join in or they'll tell everyone to ignore her. She throws a rock at the cat and runs away, hating herself for it.she goes back to check on the cat to find it dead from the rock she threw. An old lady tells her that the cat won't be able to rest in peace. Strange things start to happen around her, and the two other girls are dead, so will she end up dead too? Mihara Yuna and her family just moved into their new home. Not soon after she notices a figure standing in the doorway and she feels a cool gust of air,but the air conditioner isn't set up and it's the beginning of summer. Her father has started feeling unwell. She starts seeing the white shadow turning up in other places. And she hears voices saying to get out. Soon she hears from the real estate agent that the house is haunted that the whole family died in that house on the 29th of July. Any family that moved in died, and the day they moved in was July 28th. Mikoto and her childhood friend, Yamato are staying at her grandfather's temple which they use as a hostel. In Mikoto's room, she finds a doll. She is told that the doll is that of a dead child. She then prays for the child. She is woken up in the middle of the night by Ayano, the dead girl, asking for water. Then she continues to ask for more and more, gaining everything she wants. But then she wants Mikoto's life. Will she give it to Ayano? Emiri finds the notebook of her decease mother in her study, and decides to write horror in it. But then the events that she wrote about start happening around her. She knows she must stop writing in the notebook, but suddenly her arm is taken over and forcing her to write. People around her are starting to die, but how can she stop it? Mayumi says that the red string tyed to her pinky is attached to her life long partner, Yuuya. And then, Yuuya is hit by a car at in intersection. But has the red string really been cut? I was actually pretty surprised that no one had wrote a review for this, so i'll be the first to write one. Story 1: I sort of suspected who was the culprit in this one, and I guess it's pretty average. Story 3: One of the best stories, if not the best, in this manga series. It was simply shocking. Character (8): The expressions of fear and reactions to certain events was very realistic; from possessive anger to extreme paranoia and terror, and even the faces of the possessed where all very accurate. Overall (7): It wasn't scary, but it is definitely worth a read, i'll give it that. If you're expecting some unique, controversial Franken Fran of manga horrors, i'd look somewhere else. There's nothing special about this, but it doesn't have to be special to be enjoyable, and it was. I'd recommend this for anyone who just wants a short interesting read.